TORONTO and CAMBRIDGE — Drivers, start your engines! The Ontario Truck Driving Championships (OTDC) is just a few weeks away and though it’s not all about speed, a great deal of skill and discipline are needed to walk away with the big trophy at the end of the weekend. For the uninitiated, the Truck Driving Championships is equivalent to the Olympics in the trucking world. The best drivers from the best fleets go head-to-head in a series of events at a regional and then (if they qualify) provincial level—ultimately going to the national championships to go up against the best in the country. Competitors face off in three separate events at these championships: a written test consisting of 50 questions regarding the rules of the road; a pre-trip vehicle inspection where in eight minutes, while being watched by an MTO officer, they need to identify five planted defects; and negotiating a series of driving obstacles, such as backing into an alley dock with only a set number of inches of clearance. The events are completely run by volunteers who participate out of their passion for the event. And who wouldn’t want to volunteer during a (hopefully) hot and sunny July weekend where a little friendly competition is in the air? 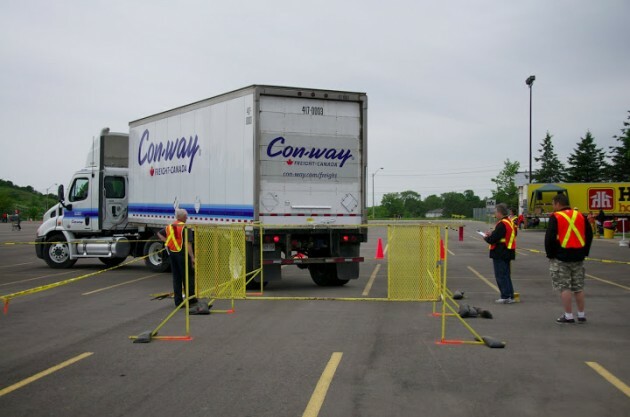 Like all major sports or discipline-based competition, the Truck Driving Championships have a specific set of rules all participants must adhere to in order to compete. All competitors in the championships must be full-time drivers and must be accident-free for the 12 months preceding the date of the competition. No competitor is allowed to use his or her own truck. Instead, the trucks used at the event are donated to ensure each participant is on an even playing ground. The championships divide the vehicles up into five classes: straight truck, single-axle tractor with a single-axle trailer (single- single), single-axle tractor with a tandem trailer (single-tandem), tandem-tandem, and B-trains to ensure the biggest cross-section of professional truck drivers can compete. All events are open to owner/operators as well as company drivers who want to show off their skills to the trucking community. Jim Schaefer, a company driver for Tim Hortons, who has been driving trucks professionally for more than 32 years, has been competing in the championships since 2009 and has been to all three events: regional, provincial and national. He was the first place Ontario provincial winner in the B-train category last year. “I cannot think of one negative thing about (the championships), other than the fact that I didn’t win the nationals,” Schaefer joked. Schaefer said his favourite aspect of the championships is how family-friendly it is. He said he and his wife made several friends at the event over the years and looks forward to seeing them every summer. This year’s competition marks the second year in a row for Fortigo Freight Services. Elias Demangos, president and CEO, says there is not enough publicity for the event and the benefits of the championships extends beyond a business standpoint. It allows the public to see the trucking industry differently. “It’s an opportunity for us as an industry to bring awareness about the drivers because there are humans behind these big rigs and these humans are professionals and they take great pride in what they do,” he said. One of the more talented drivers in the championships is Clary Ward of Con-way Freight who heard about the competition years ago from a co-worker. “He was involved in them and talked to me and said I should come as it’s a lot of fun,” he said. This will be Ward’s tenth year competing. Last year, he won first place at both the provincial and national levels in the single-single division and his employer rewarded his outstanding performance with a brand new Ford pickup truck. Ward also said Con-way allows him and other company drivers participating to practice when the championships are looming. Though everyone I’ve spoken with about their experience at the competition agrees the event is filled with positivity and friendly competition complete with cheering and waving from the sidelines, the pre-trip inspection is the part of the competition most drivers worry about. Ward said the national pre-trip inspection was the most difficult, since the competitions get more challenging as you move up in the championships. “I found four out of five. It was very hard this year in Vancouver. I know there were a lot of competitors that only got two out of five,” recalled Ward of the national championships. Ward said his favourite obstacle is the serpentine with three barrels. But more than anything, Ward says he likes the competition because he enjoys getting together with the other competitors he got to know over the years of being a participant. With the good word about the championships, many representatives have said they usually get the same drivers year after year. This is no doubt due to how enjoyable the games are, but also a reflection of how little the championships are publicized. “The central and Ontario events are always looking for more people,” said Doug Nicholson, service centre manager for Con-way based in Hamilton. Ewen Steele, president of the Ontario Truck Driving Championships, speculated that the fees are sometimes to blame for the lack of registration. Danbrook suggested that the companies not sending their drivers may not be the problem, but rather the drivers themselves who are hesitant to compete. “I don’t think we’re near as appealing to the drivers nowadays because they’re on the road for a week at a time, and when it comes to the weekends, they want their own time,” he said. “But that’s just my impression.” For anyone hesitant about participating, former provincial winner Schaefer said that it’s important to remember it’s just a drive. So, what would the president of the OTDC say to those competitors who are on the fence about joining? Regional qualifies will take place on Saturday, June 14 in both Toronto and Cambridge. The top placing performers who at those events will move onto the provincial championships which will take place in Barrie on July 12. Transportation Media is the exclusive media sponsor of the Ontario Truck Driving Championships. Look for continuing in-depth coverage, including driver profiles and competition results on TruckNews.com.